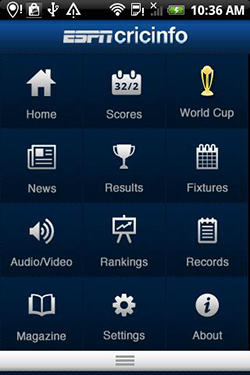 Now you can easily track your favorite world cup matches on your iphone and android devices. ESPNcricinfo has launched a new cricket app for Apple iPhone and Android devices, which will give users enhanced coverage of the World Cup 2011 and much more. This app is featuring a special World Cup section which includes all of ESPNcricinfo‘s in-depth coverage of the game including ball-by-ball commentary, breaking news, incisive opinion pieces from the World’s best cricket writers and audio and video features. As we all know that ICC Cricket World Cup 2011 is going to start from 19th Feb. And all Cricket Fans must be excited to watch world cup. But many people sometimes get engaged in there daily schedules. 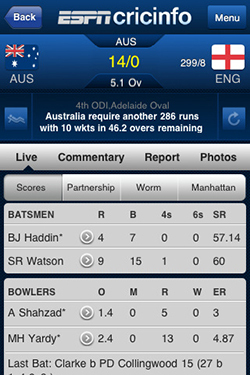 So this app is specially useful for those peoples to keep them updated with Live Cricket Scores. 1. Live game coverage with Commentary, scorecard and much more. 2. ESPNcricinfo video and audio podcasts. 3. Instant alerts for scores, wickets and much more. 5. World Cup 2011 – Dedicated cricket World Cup 2011 section featuring squads, standings and stats and exclusive video content. Users will also be able to customize news, results and other updates by their favorite team. ESPNcricinfo is available for free from the Android Market and it will run on any device running Android 1.6 and above. I have given links for download below. Also Read ICC Cricket World Cup 2011 Schedule. Next: How to Use Gmail As SMTP for Email Marketing?